With a local volleyball tournament coming up at the weekend, I was more or less tied to the Bay Area for the coming week but still wanting to get out for a few days. I decided to head up to Marin County again now that we've had 4-5 days of sunshine to help dry out the wet hills. There was a scattered group of 9 summits that I wanted to tag in a long day that would take in 22mi and more than 4,000ft of gain for a pretty beefy outing. The highest of these, Pine Mtn, is a P1K that I had visited seven years earlier with my kids. Today would take in the surrounding summits that I had missed on that first visit. My wandering, all through publicly accessible lands, would cover portions of the Mt. Tamalpais Watershed, the Cascade Canyon OSP and the Gary Giacomini OSP. All but three of the summits required some amount of cross-country travel with bushwhacking ranging from none to moderate amounts. The one summit, Dutchmans Rock, that I thought might have a horrible bushwhack judging from the satellite view, turned out to have a swell use trail to the summit - nice! I had driven up through SF the night before, reaching the Mt. Tamalpais Watershed above Fairfax along the Fairfax-Bolinas Rd around 9:30p. The road is currently closed to through traffic due to storm damage, but conveniently it's closed just past the TH I planned to use. Because the watershed is extensively signed for No Overnight Parking, I parked just outside the large sign above the Meadow Club Golf Course, and was able to sleep unbothered the whole night. Unbothered by local law enforcement, anyway. I had to get up a few times to pee in the night and was startled by the cries of coyotes prowling outside that I apparently disturbed. Luckily, no coordinated attacks which could easily have taken me out while I had my pants down. In the morning it was 37F outside which had me rising ever so slowly, not getting to the TH until after 7a. This is the only summit of the group located south of the road, a mere quarter mile from where I parked at the Azalea Hill TH. The trail skirts the summit on the east side, but any of several use trails can be found to take one to the open summit. Views of Mt. Tamalpais to the south, San Pablo Bay to the east, and the higher peaks I was heading to next to the north. About as easy a summit as it gets. I headed back to the TH, crossed the road, and followed the gravel/dirt Pine Mtn Rd to the northwest, turning south when I got to the Oat Hill Rd junction in a mile. The fireroad follows a pleasant ridgeline separating Alpine Lake from Kent Lake, two of the reservoirs managed by the Marin Water District as part of the Mt. Tamalpais Watershed. Liberty Peak is the first summit encountered along this ridge heading south, about 3/4mi from the junction. I would like to say that one simply follows the road to the highpoint to find the use trail leading to the summit, but sadly, I found none. From the road's highpoint on the south side of the peak, all is thick chaparral and not recommended. Better is to climb up the slopes from the east where the trail passes nearest the summit. This is fairly easy at first in the oak understory, but the top requires about 100ft of navigation through some pretty thick chaparral to find the highpoint. This was the toughest of the lot, though not terrible. The reward for one's perseverance is some pretty poor views across shoulder-high brush. Located about 1/5mi west of the fire road, Cliff Peak has a distinguishing rock outcrop that undoubtedly is the source of the name. The brush looks rough, but there are several use trails that lead to the rock outcrop. Despite the name, it isn't really a cliff and can be climbed at class 2. If the summit were at the top of the outcrop it would be more honorable, but in fact its a little further to the northwest. Again, the intervening brush looks rough, but there is an old use trail that helps make this far easier and only slightly brushy. So-so views on this one. The road continues southeast from near Cliff Peak, another mile to Oat Hill. A junction is reached shortly before it, warning that the road/trail dead-ends ahead, but not before turning off for Oat Hill. All of the cross-country on this one was in oak understory, fairly easy, but it's good to watch for poison oak. No views whatsoever from the summit. So sad that I didn't take a single photo. I returned north on the Oat Hill Rd, stopping near where I had turned off for Cliff Peak. Dutchmans Rock can be seen to the southeast down Lily Gulch on the east (left) side. An unsigned trail, better than your standard use trail, starts down a grassy slope. The trail improves just where you expect it to collide with the brush below, weaving deftly through the brush and then into forest understory. The trail crosses Lily Creek and then traverses out on the east bank to a clearing where Dutchmans Rock is seen nicely in profile. The trail re-enters the oak forest, branches at least once (follow the obvious fork towards the summit) and then climbs steeply up to the summit, finishing with another nice cut through the brush. This was the most unexpected of finds and consequently I thought it the best summit of the day. The summit is a collection of rock and grass with open views that would make a lovely picnic site. I liked it so much that I spent some time on the way back clearing downfall from the trail. 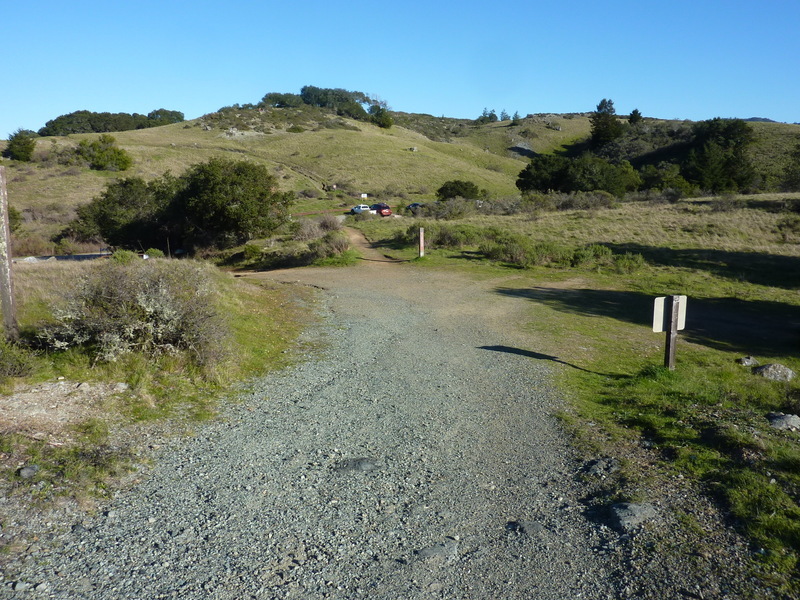 It looks like a trail branch continues downhill to the Fairfax-Bolinas Rd in about a quarter mile. I didn't explore this however, leaving it as an exercise for the reader. Interesting and disappointing at the same time. It might have better been named Happersberger Ridge since that's really what it is, descending east from the main crest down to Cascade Canyon OSP. LoJ depicts a point high on the ridge with maybe 5ft of prominence, buried in chaparral and wholely unsatisfying. A better point, and quite possibly what was intended by the confusing labeling on the 7.5' topo maps, is the open, grassy area lower down. Still not much prominence but at least nice views. The Happersberger Trail is unsigned at its junction high on the main crest. I had to hunt around some to find it (I knew it existed from the satellite view), then decided to follow it all the way down to the bottom (where a sign oddly declared it closed due to storm damage though I saw none) where it joins the trail system in Cascade Canyon. I turned north and soon crossed a bridge over Cascade Creek, intending to take the Cascade Canyon fire road back up to the main crest, having spied it during my descent of Happersberger Ridge (this loop section was unplanned, but worked out nicely). Right after the bridge is another junction with the San Anselmo Trail which I thought might make a good alternative to the fire road. Unfortunately, the trail was ripe with fresh poison oak and soon ended without much warning. I backtracked to the fire road and took that back up. Back at the crest I turned north and followed the San Geronimo Road for 2.5mi to Green Hill, a small, forested summit overlooking Kent Lake. The fire road goes within about 50ft of the summit on its west side, the short bit of cross-country quite easy but leading to another summit with no views. Better views can be had from the road. One can follow the fire road northwest to Sir Francis Drake Blvd in less than two miles, but this was as far as I would head in this direction and it was time to turn back. Another 3mi back along the crest brought me to the Pine Mtn/San Geronimo junction where I turned west. Pine Mtn is not the first hilltop encountered to the north of Pine Mtn Rd, but the second, where the road passes closely on the south side. There are several use trails here, the shortest being directly up from the saddle on the east side. At first glance there may not appear to be a trail, but a closer look reveals a break through the brush. The summit is one of several rocky locations, the eastern one with a steel post embedded in the rock the likely highpoint. Best to visit both. The views, as one might expect from a P1K, are pretty good in all directions. I descended another use trail of sorts heading off the west side.